Overlooking the Wye Valley and offering the visitor wine tasting and tours of the vineyard. 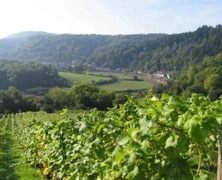 For nearly forty years this award-winning vineyard has overlooked Tintern. Visitors are welcome to stroll among the vines and try our wines. It definitely feels like spring now and with the clocks changing, we will have lighter evenings to get our work done. 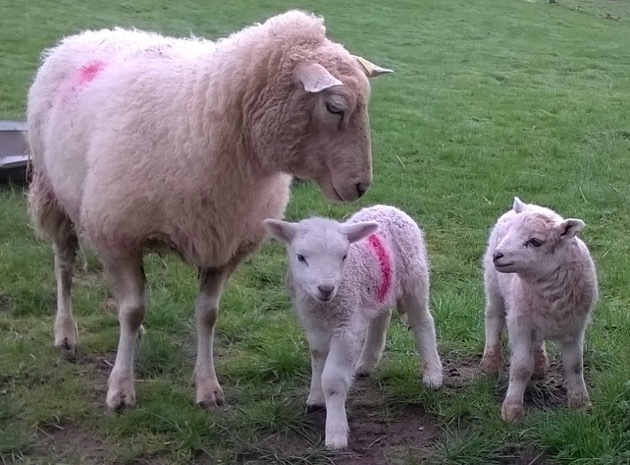 We have already had some lambs - two sets of twins - and by the time you read this, there will be lots of the little woolly things bouncing about. The next few weeks mean hard work and disturbed nights but it is worth it when you can watch the lambs racing up and down the field and doing lamb leaps! The pruning is nearly all finished in the vineyard. We are now tidying up and Colin is replacing any rotting stakes (of which there are quite a number). The vines do not come into leaf until the end of April but the buds are starting to swell already. Because of the generally mild weather, I have seen several butterflies in the vineyard as well as ladybirds and bees and wasps. Colin has been busy creating a new vegetable garden. He is determined to keep out the rabbits and deer and also stop the cattle and ponies from reaching over the fence to nibble anything which grows too high. We have been having more and more trouble with deer in the garden recently so it will be good to know that at least the vegetables will be safe! If it works, we should be able to grow some good vegetables this year as we also have a plentiful supply of manure! 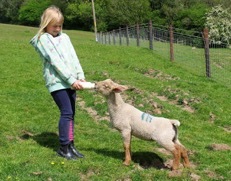 At the end of April we will be doing our usual “Come & See the Lambs” exhibition. This year we have decided to do it a bit earlier than usual because of the forthcoming road closure on May 8th. It will start on Saturday 20th April and run until Monday 6th May from 11.00am until 4.30pm every day during that fortnight. As usual there will be a charge of £1.00 per person as we do it for charity. This year the charities we are supporting are Guide Dogs and Animals Asia. Parva Farm Vineyard was planted in 1979 on a south-facing slope, overlooking the village of Tintern and the beautiful River Wye. Colin and Judith Dudley (the present owners) took over the farm and vineyard in 1996 when it had been badly neglected and worked to bring it back to the productive state in which you will find it today. 4,500 vines of 15 different varieties cover an area of approximately a hectare. These old vines produce high quality grapes from which our white, rosé, red and sparkling wines are made. 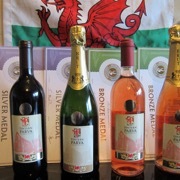 Over the years many awards, both national and international, have been won by our wines. Our specialities are Bacchus dry white, Pinot Noir rosé, and white and rosé sparkling wines. Leave the crowds behind and stroll among the vines learning about the history of the vineyard and winemaking and how we grow our vines on this Welsh hillside. Admire the wonderful views from the top of the vineyard and perhaps bring a picnic and relax in a quiet place to enjoy it. You may glimpse some of our wildlife – we have a resident family of green woodpeckers and buzzards are frequently seen. Vineyard tours may be self-guided (following the arrows and reading the signs) which can be taken any time during opening hours or guided, which need to be booked in advance. Tours are followed by a tasting of some of our wines. We do ask that you wear sensible footwear as the vineyard is fairly steep and the grass can be slippery. Because of the steep slope, the tour is not suitable for disabled or infirm visitors. 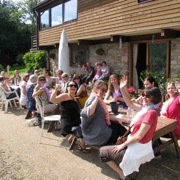 Guided tours and wine tasting are popular with groups (we can cater for 8 to 25 people) and can be taken in the day or evening during the summer months. (Please see more details below.) They are also great for hen parties! We do special tours for couples or very small groups by arrangement. After a tour, it is usually possible to book a meal at one of the local hotels. The Wye Valley Hotel is at the bottom of our drive and Sue and Barry would be pleased to hear from you. (Phone 01291 689441). For special events, please see our website. The shop is open every day except Wednesday from 11.30am to 4.40pm in winter and from 1.00pm to 5.30pm in summer. Our full range of wines is on sale and available for tasting alongside our Mead and Fruit Wines. We sell locally produced Perry, Cider & Ale, local honey & preserves. We also have a range of gifts and wine related products. Outside, around a seating area, there are garden plants and shrubs for sale – many of which are unusual. There is a picnic table in our garden which visitors are welcome to use. 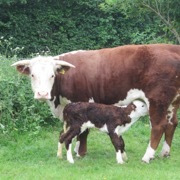 The vineyard is situated on a working farm where there is a small herd of pedigree Hereford cattle, sheep and ponies. 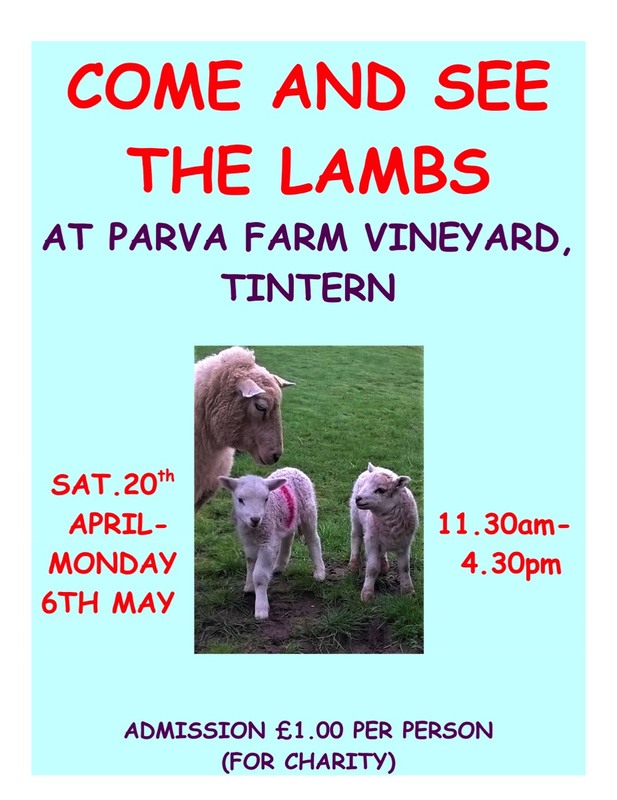 In the spring, after we have finished lambing, we hold an exhibition called “Come & See the Lambs” in which we have ewes and lambs and sometimes orphan lambs. 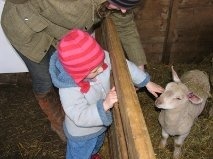 There is also information about sheep and how we look after the flock at Parva Farm. We have our own car park where we can take cars and small coaches. Unfortunately, large coaches are unable to access it due to a bend in the drive.